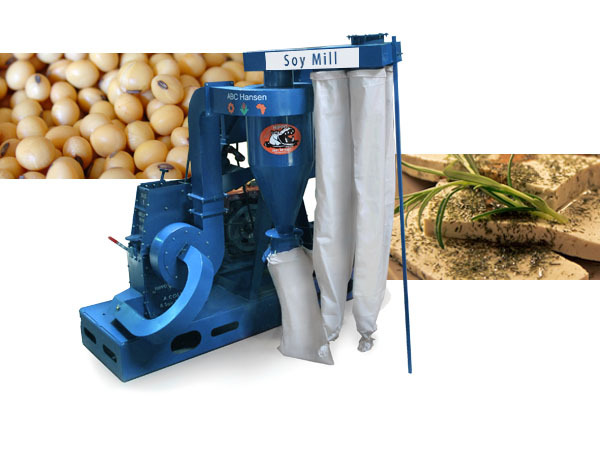 The Universal Mill with plate attachment manufactured by ABC Hansen with stainless steel contact parts, are very well suited for soy bean flour a production at the rate of around 500 kg per hour. Soy beans may be milled after having undergone dry de-hulling dry with the ABC Hansen polisher, to reduce on bran content in the flour. (Note, the polisher is also very well suited to split soy beans.) Soy beans may also be milled with hulls if so desired especially to create a high fibre flour. Some hulls may also be screened off after milling to retain only smaller particles of bran. Roasted soy beans may also be milled for full fat soy bean meal. (Roasters may also be ordered from ABC Hansen). When de-hulled on the ABC Hansen polisher prior to milling and after roasting, a higher protein meal would be obtained. Note: soy beans should be fully roasted at minimum 140 degrees C to allow the trypsin protein inhibitor to be neutralised and allowing the full protein to be digested. Soy bean oil cake may also be milled after the beans have undergone extrusion or roasting and expelling of oil. When the soy beans are roasted or extruded (extruders may also be ordered from ABC Hansen), followed by expelling of the soy bean oil, the low fat oil cake may also be milled with the Universal mill for low fat soy bean oil cake. Again, de-hulling on the ABC Hansen polisher either after roasting or before extrusion, would increase the protein in the soy bean flour. Low fat, de-hulled soy bean flour would contain the highest level of protein.